Are you planning on making mashed potatoes, a rustic gratin Dauphinois (gratin of potatoes) or a heartwarming soup? With this make-ahead tip, you can start preparing your potatoes ahead of time. Say you have a few minutes to spare, you can get the peeling done beforehand and check one thing off your list! 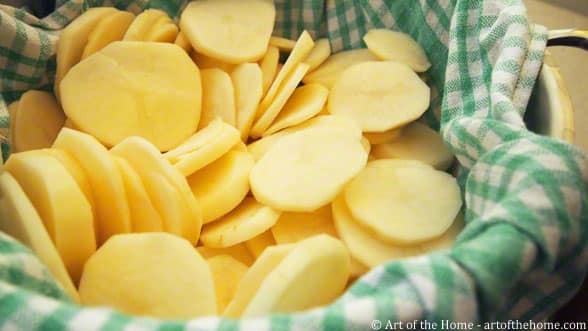 The problem however is that after potatoes have been peeled, unless you use them right away, they will change color. First they’ll turn pinkish, then brownish and finally get to greyish – pas très joli (not very pretty). So check Art of the Home make-ahead kitchen tip below on how to prevent peeled potatoes from darkening. It saves time before dinner time — less stress, more joy! Peel your potatoes (you can even pre-cut them) and put them in a bowl of cold water. Place bowl in the fridge until you are ready to use. We do this up to one day ahead. When you are ready to cook your potatoes, take the bowl out of the fridge, gently rub the potatoes in the water to remove any deposits on the potatoes. Drain and rinse potatoes in a bowl of fresh clean water. Pad dry — your potatoes are ready to use and will look as if you had just peeled them a few minutes before. And voilà!